Bell Island Cottage at Bell Island Cottages in Whitby, Yorkshire sleeps 4 people. Bell Island Cottages in Whitby is a lovely cottage which successfully combines both traditional and contemporary styles. Situated over three floors, the cottage is accessed at street level into the stylish and well-equipped open plan living space, complete with natural slate flooring, leather sofas and an oak dining table. 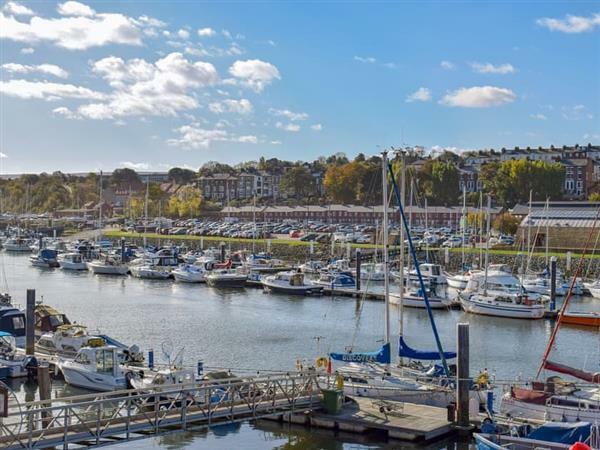 There is a cosy double bedroom located on the first floor and a twin room on the second floor, and both have comfortable furnishings as well as stunning views over the marina. Whitby has it all and is the perfect tourist destination with so much to see and do. Visit the historic abbey, St Mary’s Church and climb the 199 Steps for stunning views over the town and out to sea. Take a steam train ride on-board the Harry Potter Express on the North Yorkshire Moors Railway as it snakes its way through fabulous scenery of the North York Moors National Park to Grosmont, (Aidensfield from TVs Heartbeat) and Pickering. Learn about Captain Cook’s time in Whitby and his epic voyages at the Memorial Museum or even take a pleasure boat out to sea in search of minke whales and dolphins, or enjoy a fishing trip from the harbour. Whitby is said to be the inspiration behind Bram Stokers’ Dracula and plays host to bi-annual goth festivals, or enjoy a nightly ghost walk for the brave hearted. There is a long stretch of golden sands to enjoy from Whitby heading north through the sought after resort of Sandsend. Whitby is also host to many festivals and events throughout the year such as the annual regatta, Folk Week, Motown Weekend and Steampunk. The stunning North York Moors National Park is a walkers and cyclist paradise, with routes to suit everyone from championship level cycle tracks to a stroll along parts of the Cinder Track, which runs from Whitby to Scarborough along the railway line. The Cleveland Way is always a popular choice as it runs across cliff tops and down into hidden bays and coves such as Robin Hood’s Bay, Staithes and Runswick Bay. Neighbouring Scarborough has two large bays, an open air theatre boasting top international artists throughout the summer, a water park and the Sealife Centre. The beach is 400 yards from Bell Island Cottages in Whitby. With the shop 100 yards, and the pub & restaurant are 15 yards from Bell Island Cottages. Bell Island Cottage can be booked together with Laverick Steps (ref UK2592 [Laverick Steps]) to sleep up to 6 people. Bell Island Cottage has a step to the entrance. Living area: With 22 Smart TV and DVD player. Gas central heating, electricity, bed linen, towels and Wi-Fi included. On road parking. No smoking. Holidays at Bell Island Cottage, Bell Island Cottages run from Monday to Monday. For a better idea of where Bell Island Cottages - Bell Island Cottage is, you can see Bell Island Cottages - Bell Island Cottage on the map below. Bell Island Cottages - Bell Island Cottage is in North Yorkshire; should you be on the lookout for a special offer, you can find all the special offers in North Yorkshire. It's always worth checking to see what is on offer at the moment. Do you want to holiday near Bell Island Cottages - Bell Island Cottage (UK2591), you can see other cottages within 25 miles of Bell Island Cottages - Bell Island Cottage; have a look to find your perfect holiday location.